When building garages—and we’ve built 1000’s since 1973—many of our customers not only want a new building but that has the look and feel of their residence. With 18 sidewall and trim colors to choose from, we were confident that we could get a good match for our Sequim Washington customer – and we did. His next concern, like so many customers, was his Clallam county compliance in constructing a new building. With a robust permit staff at the Lynnwood office, we have the in-depth knowledge in getting the permits expeditiously. 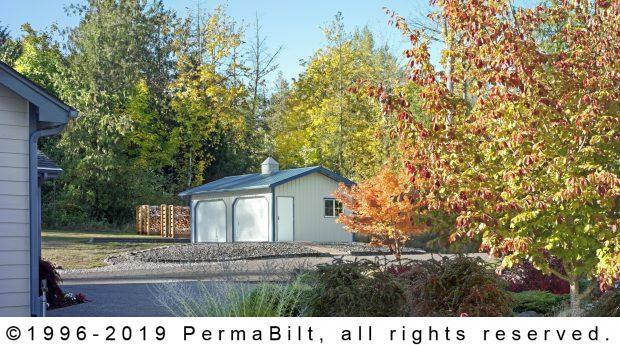 But in this case, our customer simply chose not to exceed a certain size of his 2 car steel garage and workshop thus avoiding the permitting process altogether which is an option that was available in Clallam County at the time. Once erected, the building blended flawlessly with the style of his home.